As an urban dweller, I belong to a meditation group, and our recent discussion centered on the effectiveness of green powder supplement especially the one from the amazing grass. What a name I thought to myself, so this amazing grass green Superfood review is borne out my assignment to let members of our group know the merits of the product, and if it is good for those looking to stay with high alkaline foods. This best Superfood supplement can make your detoxification efforts easier to accomplish. Since it is sourced from only organic ingredients, you’ll feel more energy as it makes your immune system stronger. If you’re into taking green food supplement, take your time to find a good brand for excellent healthy results. 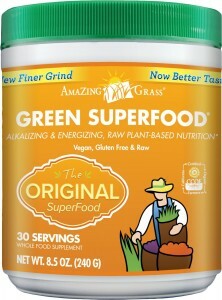 To make this review personal from my experience, I ordered my own amazing grass Superfood green supplement. You can read about my final verdict about the product towards the end of this post. You have to give kudos to the founders of this company, for coming up with a product that’s not only selling well but also beloved by tens of thousands of consumers all over the world. 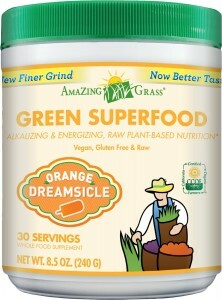 The Superfood greens powder from amazing grass is made from a unique and proprietary combination of organic and non-GMO ingredients. Some of the most active ingredients include natural barley grass, wheat grass, alfalfa, spinach, spirulina, broccoli, and chlorella. Not only will it help your digestive system function better, but your need for high alkaline fruits and vegetables can be achieved from just taking this green supplement. 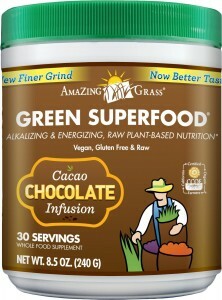 Amazing Grass Green Superfood is fully certified organic by the California Certified Organic Farmers (CCOF) association, and can safely be consumed by those into the vegan lifestyle. It is kosher, raw and delivers a bunch of whole food nutrition with every serving. For my first try with this product, I created a smoothie using water, sweet organic apples, fresh limes, and a few teaspoonful of the green supplement. I soon discovered I used too much of the product, so I added more water and other ingredients to make it easier to swallow. I tried drinking it by itself in a glass of water and found it hard to swallow. My friend, who is a raw food enthusiast, calls it the miracle food for those that are in tune with nature, and proudly says it is what our body needs to grow without any toxicity involved. He drinks it straight-up and loves it! I was not that brave, so my first try involved masking the product in a smoothie to make the taste more palatable. As I closely examined the nutritional panel on the container, one can tell the final product has a good combination of well-rounded antioxidants, natural Probiotics, good digestive enzymes and a good dose of added fiber. It is a comprehensive green supplement, but the exact percentage of each added nutrient is hard to come by. I asked the company for a breakdown of the nutrition list and they declined for many good reasons. With so many copycats lurking to steal many years of handwork and research from a product like this, do not blame them for not being forthcoming when it comes to ingredients percentages and formula setup. It’s like asking Coca-Cola for the secret recipe! Here is a clear image of some of the listed nutrition facts, but trying to create your own product in your kitchen will fall short, as certain crucial steps were omitted on purpose. But hey, it never hurts to try if you have the time and resources. Taste is always subjective to the individual. I have never liked drinking the slightly bitter stuff, and will always masked the taste by adding other natural ingredients to make it more palatable to swallow. If you’re a vegan or raw food enthusiast like my buddy, you should find the taste more to your liking. So from my perspective, super green food powder will not win any tasting competition, as it was created to deliver amazing good natural nutrients into your internal organs, without any added chemicals or toxicity. If you’re new to green drinks, you should at least mix it up with other ingredients like I did. Best of all, mixing it up with other natural products will not affect the powerful results in any shape or form. Also, on the manufacturer’s website, there are many suggested natural ingredients you can use with the green food powder to get the most amazing potent results. When I look at some of the stuff I have spent money on, buying this green powder supplement was a wise investment for my health. You have a choice of the container size to get, and the larger the sizes do have a cheaper per serving cost. I also noticed that the company now has many different blends to accommodate all those that needed more taste in their green food powder. I only tried the original formula, and I suggest you make that your initial purchase to give you a better idea of the power of the product to deliver amazing health benefits. This blend delivers the same benefits, but it also contains an infusion of Cacao chocolate within the ingredients. If you prefer a little sweetness to your supplements, this blend should serve you right, with the same awesome healthy results. This one cost a little bit more than the original version, but it is specially formulated to promote the timely elimination of toxins from the body. It also has ingredients to give you the needed support for a healthy PH balance. 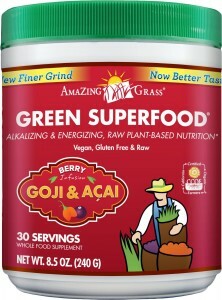 This Superfood blend from amazing grass is infused with additional antioxidants and Carotenoids; all derived from organic Goji and Acai berries. The powerful combination delivers the same excellent results as the original version with probably a better taste. While it is priced the same as the original green food powder, you do get slightly less quantity in the container. Added to the ingredients list are Matcha, Mate, Guyaki Yerba, and real lemon-lime infusion. 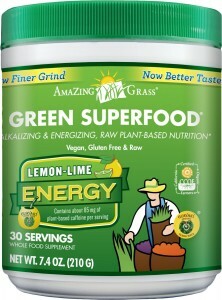 This lemon-lime energy drink powder is designed to give you more clarity and well-being. Firstly, ORAC means – Oxygen Radical Absorbency Capacity. This blend is formulated to help fight off the effects of free radicals, which might otherwise do much damage to your body’s organs. In fact, the company says it is a good sidekick to the original formula. It has a slightly berry flavor, and will help your brain function better, while improving your immune system. The additional ingredients can also enable healthier skin. You get less quantity for the same price, just like the original version. Apart from containing all the alkalizing green superfoods, you have a slight infusion of Acai and Maca so you get a whole lot of powerful nutrition from each serving. The superior taste is derived from the unique combination of citrus-orange and a cold, creamy vanilla. 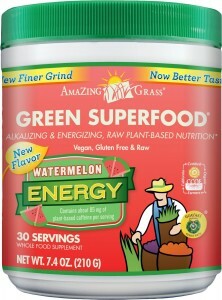 If you find the taste of the original super green food powder too bitter, this blend has better taste due to the other added sweet ingredients to the formula. For the same price, you’ll be getting less quantity due to the additional ingredients. The ingredients list includes 15 additional vitamins and minerals. The sweet taste is made possible from the blending of exotic Pineapple and coconut water, to deliver a Lemongrass flavor in each serving. Not only does it have great taste, the included multivitamins should also serve your body well. Included in this blend are herbs, immune-boosting mushrooms, and 1000 mg of vitamin C. Also included are probiotics and enzymes to help increase digestion and absorption. 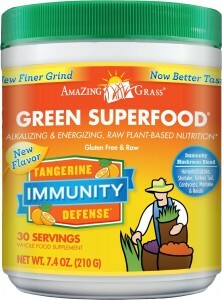 While it offers better immune defense, the way the better taste was achieved is not clearly spelled out, but I suspect the inclusion of the tangerine fruit has a lot to do with it. You get less quantity, due to the added extra ingredients, and it also cost a little more than the original amazing grass green Superfood powder. Not only does this blend cost you more, but you get only 7.4 Ounces quantity in the container instead of the usual 8.5 Ounces. A notable exception to this blend is the inclusion of plant-based caffeine ingredient in the formula. The potent combination of the Superfoods does deliver more energy, due to the presence of caffeine in the natural ingredients list. It is still made from completely 100% organic ingredients, and the included enzymes and probiotics will give you better absorption and digestion. The way you prepare and take this green foods supplement will only be limited by your imagination. There are many ingredients you can add to it, if you’re using the original formula with its bitter taste. If you prefer your super green food powder slightly sweetened, why not just buy one of the other flavors to negate the need to add extra ingredient in your smoothie. I would suggest you use less of the product in the beginning, as you search for the ideal recipes you can adapt to your lifestyle. Just based on the company profile alone, this is one of the top 10 superfoods on can find online with amazing performance metrics. With so many flavors to choose from, you can easily find one blend to accommodate your lifestyle. The ingredients list is truly organic, even for the sweetened blends. As I searched online for greens supplement, this company delivers more value than most of the others combined. Remember all the blends of Superfood greens powder is certified organic, and proudly made in the U.S.A.
With so many blends the pricing seems a bit convoluted. The better tasting blends will sometimes come with less quantity, but higher priced. The original formula does have bitter taste to it, and takes other ingredients to make it more easily digestible. I have tried several supplements in my lifetime, and I must point out certain issues for those looking for a magical cure for bad lifestyle choices. If you engage in bad lifestyle choices on a daily basis, even the best greens powder will not cleanse you fast enough, for the damage you’re doing to your body to manifest itself. 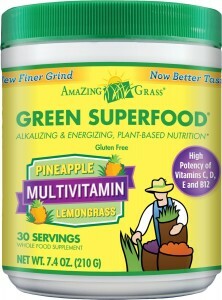 The many blends of amazing grass green Superfood can only be called a true miracle in a container. After a few days of taking the green powder you’ll feel more energized, and your digestive system will be working flawlessly to flush out toxins within your body. Hopefully, in this amazing grass green Superfood reviews, I have provided you with enough reasons to at least give the product a decent try. It is one of the top 10 superfoods one can find for less within a reasonable price range. To enhance the power of the green supplements, do remember to eat less than usual and try your best to do some daily physical exercises. 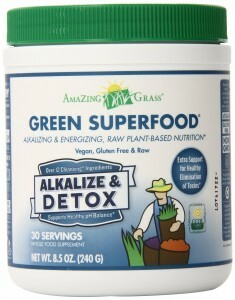 Amazing Grass Green Superfood is a superb product, regardless of which blend you choose to purchase today! Be nice to hear your thoughts after trying the best greens supplement for good health. 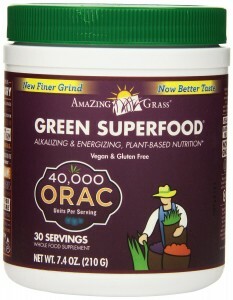 Next post: Green Vibrance Reviews: Is it the Best Superfood Supplement?